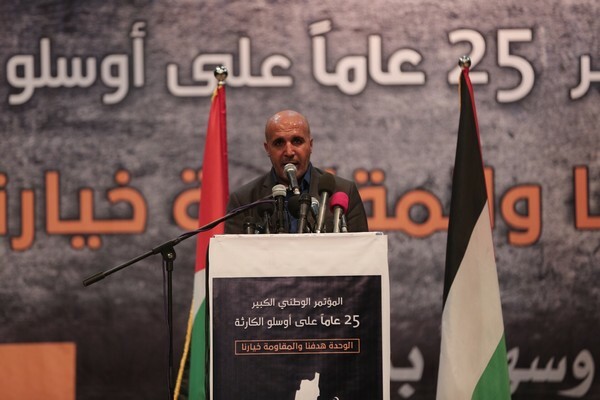 Member of the General Committee of the Popular Front for the Liberation of Palestine, Hani al-Thawabta, said that the Oslo agreement was born distorted, carrying the poisonous seeds of crisis. 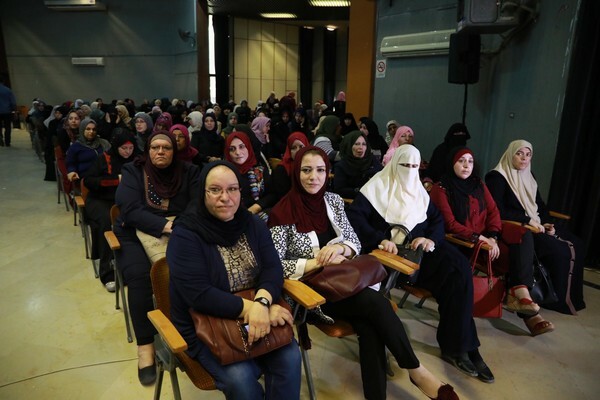 Bearing in mind the historic and political responsibility of the agreement, it was signed behind the backs of the Palestinian people, its institutions and national forces. 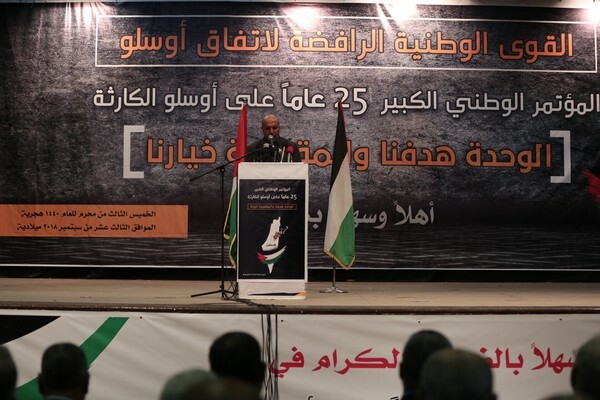 During the Popular Front for the Liberation of Palestine conference of forces that reject the Oslo agreement held in Gaza City, Al-Tawabtah added that the Oslo agreement aimed to bypass the great national questions, especially the right of return, as elements of sovereignty and progress were subordinated to the interests of the security of the occupation. The law of nationalism passed by the Zionist parliament is one of the most dangerous episodes of liquidation that began with the signing of the Oslo Accord which allowed the enemy to gradually destroy our rights. Oslo sought to impose increasing political and economic submission and the continued function of power in favor of the occupation, and reached the height of degeneration with the abolition of the National Charter: the confiscation of legitimacy and powers of the Organization in favor of the Authority. He stressed that the Palestinian leadership threw all the cards of the Palestinian issue in the bet on the US administration at the signing of the Oslo agreement, and fell into the trap of the American Zionist strategy intent on the dissolution of the Palestinian forces that had provided a comprehensive vision, rendering it powerless. The Paris Economic Agreement turned the Authority and its security services into mere servants in the American Zionist system. The Oslo agreement strengthened the state of rupture and division and robbed national dialogue of its essential contents and pillars, transforming the issue of national unity into mere political maneuvering on paper, rather than an actual consistent national political strategy governing the actions of the Palestinian national movement. He pointed out that under the Oslo agreement, our people found themselves trapped between occupation schemes of liquidation and the corrupt practices of the Authority and its security services, which exacerbated the predicament of the Palestinian masses, the national issue in the occupied homeland, and in the camps of the diaspora. He called on the people to launch the largest national and international campaign to boycott the enemy and its institutions, to confront all forms of normalization and meetings with this criminal entity, and to strengthen efforts to serve the international boycott campaign against the occupation and its supporters around the world. He emphasized the importance of an in depth national debate to determine how to overcome the effects of this disastrous agreement, confronting this malicious project from its roots in an integrated national project and a resistance based on the full investment of our power applied to the disintegration of the Oslo agreement and its security and economic obligations, to draw up a new national strategy to liberate our people from the clutches and repercussions of this agreement, considering the escalation and accelerating pace of the Zionist aggression on the rights and principles of our people. In light of the failure to draw the leadership of the Palestinian Authority through this disastrous path, we are called to accelerate the construction of a new Palestinian national policy, to leave the Oslo process and its institutions in favor of activating the PLO institutions and rebuilding them on the basis of comprehensive democratic principles and adherence to its charter and national program. The first step to do this is a new national unity council with the participation of all the people under its banner, in the homeland and the diaspora. He stressed that the alternative to the Oslo agreement must be based on the resolutions of international legitimacy and fully implemented by the Zionist entity, complete with the elimination of draft settlement negotiations, exploited by both the United States and the Zionist entity to force the Palestinian people to surrender. He called on the people to adhere to Resolution 194 as a legal basis for resolving the Palestinian refugee issue, that this issue is the core of the national issue and without solving it, the conflict is ongoing. There is no force or law that allows any political leadership to waive or cancel the right of any Palestinian citizen to return to his home, land and home, which was abandoned due to force, terrorism and massacres. Any attempt to compromise on this right will fail and will shatter on the rock of the steadfastness of our people. He said that the real alternative is to guarantee independence and sovereignty, and the rights of our people to return. 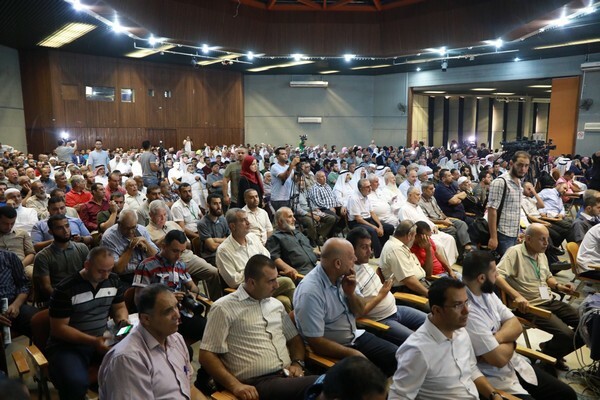 This calls for the continuation of the resistance in all its forms, especially armed resistance as the most effective way to confront the occupation and thwart its projects. He stressed that achieving reconciliation and restoring unity in accordance with national agreements in Cairo and Beirut, and ending the criminal sanctions imposed on our people, is a step towards confronting current challenges. The unified Palestinian position is the most capable of facing the challenges and avoiding all the repercussions of the Oslo Accords. At the end of his speech, the people stressed that the Front and all the patriots and our people will continue to resist and mobilize all energies to overcome this evil agreement and forge a new path of struggle in which we begin to build our national legitimacy based on resistance and declare the end of the era and the Oslo stage forever. The basis of the national partnership, the defense of fixed national rights to address the schemes of the liquidation of our rights, primarily the right of return of Palestinian refugees and the issue of Jerusalem, requires the organization of a program of continuous popular engagement in our communities at home, and in the diaspora, and the creation of appropriate forms of engagement with the occupation to activate the masses to defend their right to return to the homes from which they were displaced in Palestine, and to break the siege to end all forms of suffering. وقال الثوابتة” لقد سعت أوسلو إلى تمزيق أهم إطار وطني فلسطيني وهي منظمة التحرير الفلسطينية الإطار الوطني الجامع والمعبر الحقيقي عن وحدة شعبنا عبر إلغاء الميثاق كعربون أوسلو بحضور الرئيس الأمريكي كلينتون حتى تحوّلت رويداً رويداً إلى مجرد حاكورة أسيرة لسياسات التفرد والهيمنة والفساد، وذوبانها في منظومة السلطة والتزاماتها. حتى أصبحت اليوم وعبر إجراءات تخالف الإجماع الوطني تمثل ثلة متنفذة أسيرة أزمتها”. وفي ختام كلمته، أكد الثوابتة أن الجبهة ومعها كل الوطنيين وأبناء شعبنا ستواصل المقاومة والنضال وتحشيد كل الطاقات من أجل تجاوز هذه الاتفاقية المشئومة وشق طريق نضالي جديد نبدأ فيه بناء شرعيتنا الوطنية على أساس المقاومة وإعلان نهاية عصر ومرحلة أوسلو إلى الأبد … شرعية قائمة على أساس الشراكة الوطنية و الدفاع عن الحقوق الوطنية الثابتة والتصدي لمخططات تصفية حقوقنا وعلى رأسه حق عودة اللاجئين الفلسطينيين وقضية القدس، بما يترتب على ذلك من تنظيم برنامج نضالي وجماهيري متواصل ومستمر في تجمعات شعبنا في الوطن والشتات، وإبداع الأشكال الملائمة سواء عبر مسيرات العودة أو الاشتباك المفتوح مع الاحتلال لتفعيل جماهير المخيمات للدفاع عن حقهم الثابت في العودة إلى ديارهم التي شردوا منها في فلسطين، وفي كسر الحصار وإنهاء كل اشكال المعاناة. على طريق العودة والتحرير. Previous Post Nicaragua: Why Were There 15 Days of Protests Without Deaths from April 23rd to May 10th?